For bird lovers, the prospect of having a resident family of young birds in the garden is a very exciting one. This is why we stock a range of wild bird nesting boxes for use in your outdoor space. Our nesting boxes come in a variety of different designs to suit all requirements and cover a wide selection of UK bird species. This means that, whatever your local population may be, you’re sure to find a box or nest to suit your resident species of garden birds. 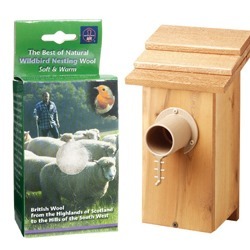 Alongside our range of nesting boxes, we also stock a selection of complimentary products, which can be used to give your birds a helping hand in building and maintaining their nest. For the more committed nest observer, we also have bird nesting boxes that can be used in conjunction with wildlife monitoring cameras, so you can capture the process from start to finish! This means that you’ll be able to keep a watchful eye on the young and how they’re doing as they progress from hatching to flying the nest! 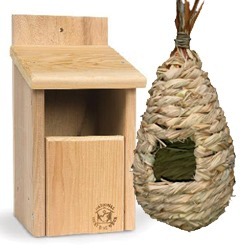 Do you have any questions about our nesting boxes for birds? Get in touch – we’d be happy to help you with your product search, or with any questions you may have.